The mystery agents are here! Zoe and Max decide to make chocolate pecan cookies with their grandmother. They travel all around the world to get the best ingredients. But the cookies disappear. It’s a mystery! Will they manage to solve the mystery and uncover the culprit? 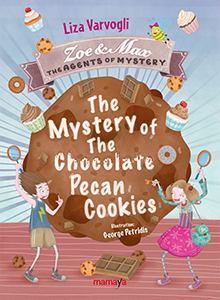 Mystery agents Zoe and Max are here and will solve the mystery with their thinking skills and their kindness.